Note: we booked this meal intending to pay our bill in full. Mo comped us a couple of extra dishes, meaning that we paid for the $132 of food we ordered and received two extra dishes worth $34 free of charge. Smith & Daughters has had an amazing menu makeover for winter! 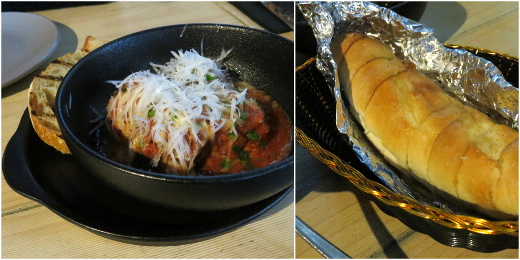 They're going for all-out carby comfort food with an Italian theme, dubbing it Smith & Bellas. In surprisingly good news for coeliacs, more than half of these new dishes include a gluten-free option. We booked in with a couple of friends to share as much as we possibly could. First up: meatballs! (Usually $12 for 3, we paid $16 for 4, above left.) They've got the right minced-meat texture, are smothered in a lovely sweet napoli, and boast some impressive parmesan. The garlic bread ($8, above right) was my must-order starter, and it was resplendent in its foil-wrapped pizza-delivery glory. 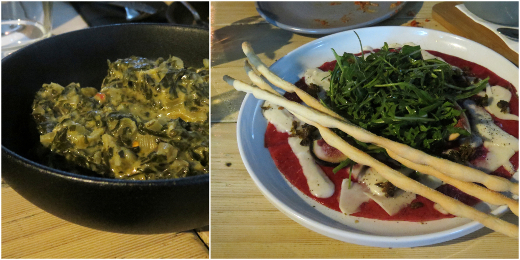 The creamed silverbeet ($10, above left) was silky soft, perked up with a little preserved lemon and chilli. Though we hadn't ordered it, Mo knew we needed the show-stopping carpaccio (complimentary on the night, usually $18, above right). They've somehow made their own flat, smoky mock-meat, which we were encouraged to roll up with a fig slice, horseradish cream, fried capers and rocket, then wrap around a crisp fennel bread stick. Wow. These shared dishes had me excited and genuinely appetised for the mains! And here things got heavy. The gnocchi ($22, above left) were the softest little dumplings with as much broccoli rabe pesto and cream as we could possibly swirl them through. The cacio e pepe ($25, above right) looked deceptively simple but these bucatini were dressed in copious quantities of black fermented garlic, a little parmesan and two kinds of pepper. 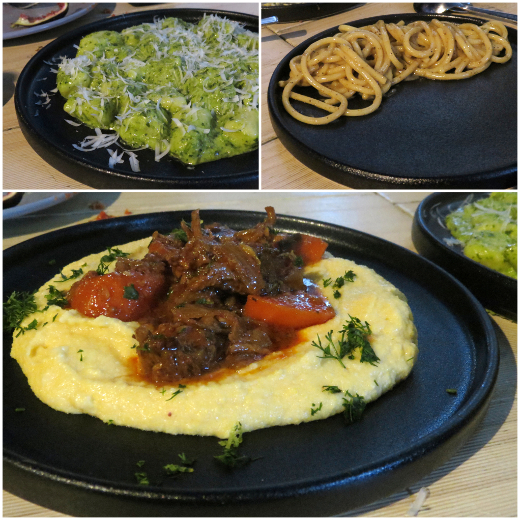 My pick, though, was the ragu and polenta ($24, main photo) - the polenta was so creamy and cheesy, and the ragu? Some of the most convincing mock meat I've ever eaten, mimicking the tenderness of a slow-cooked tough cut in a sweet gravy. Just astounding. I was determined that we couldn't leave without dessert, and we agreed on two to share among the four of us. Mo put another beautiful spanner in the works, comping us a tiramisu (usually $16) - more vegan wizardry in neat, coffee-scented layers. Our companions were most taken with the limoncello rice pudding ($12), with a crunchy brûléed crust and dainty scoop of rosemary vanilla icecream. 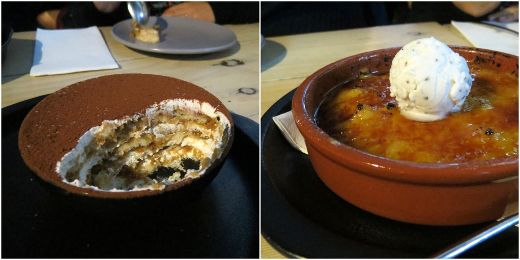 I was unexpectedly besotted with the baked Vesuvius ($15). 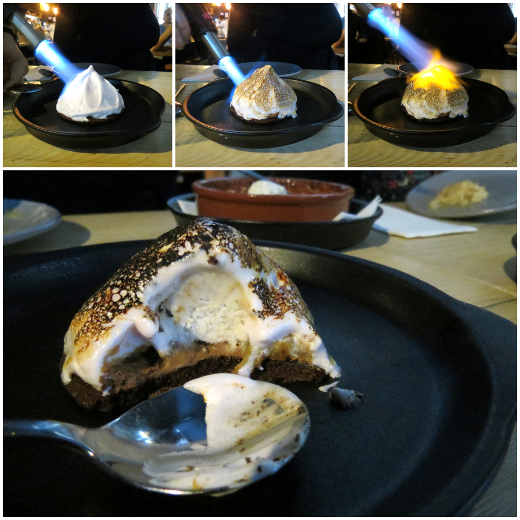 Blow-torched right at the table, I had to wait patiently to spoon through the scorched-Italian meringue crust, excavating still-firm black pepper vanilla icecream, skirting by poached quinces before hitting on a ganache-spread chocolate sable crust. I don't normally care for meringues or marshmallows much at all, but this was like a Wagon Wheel had all grown up. Smith & Daughters have bloody well done it again! This Italian phase is so comforting it's almost familiar, yet it's also delightfully inventive and packed with surprises. You know we'll be back for more. You can also read about one, two, three, four, five, six, seven, eight of our previous visits. Since that final post a fairly negative review has appeared on Lifestyle By Lily. Accessibility: The entry is flat and narrow and the tables are pretty crowded. The interior is dimly lit and loud at night. Toilets are located up several steps, are gendered and of standard dimension. We ordered at the table and paid at a high counter. all looks pretty amazing - albeit mocky meaty - I am fascinated by the carpaccio and vesuvius - wonder if the latter is aquafaba? Hi Johanna - aquafaba is my best guess, though there might be more going on to stabilise it. I reckon there are enough mock-free dishes on the menu for you to enjoy! This menu looks amazing! I wish I could get them to come to Brisbane for a night and make it for me!